Here we will explain the Nutrisail B products and what they are good for. Our Products Have No Additives, Fillers, Binders, Sweeteners Also No Magnesium Stearate. Further More Our Nutrisail B Products Are Natural, Organic, Plant Based Also Non GMO. Above All We Have Quality Products Unlike Anything You Will Find Anywhere! Therefore Dare To Compare Other Supplements To Nutrisail. We’re Confident That You Will Fall In Love With Our Products. Takes Your Energy From 4 To 10 And Your Appetite From 10 To 4. Finally, It’s Loaded With B Vitamins. Is For Those Who Need MORE Energy! Runners, Weight Lifters, Body Builders. Furthermore B-LITE XTRA is a Healthy Alternative To Those Nasty Tasting Energy Drinks. Is One Of Our Core Products For Those Caffeine Sensitive Folks. Also Great for Children And Pets. B-Free Has The Same Great Benefits As Our B-LITE Classic, Without The Energy. Therefore B-Free Is Excellent For Use In The Evenings To Stop Those Munchies And Cravings. Also B-Free Is Great To Take On Your Caffeine Free Days. Our all natural products are designed to help you live better, feel better and look better. Our products literally speak for themselves! So research our ingredients and you will see what we mean. Also Nutrisail uses only the purest grade A ingredients that money can buy. We take no shortcuts and spare no cost when it comes to providing superior products for you our customers. Above all our product are natural, organic, plant based and non GMO. Just quality products unlike anything you will find anywhere! Dare to compare other supplements to Nutrisail Products. We are confident that you will fall in love with our products. Also every order for our Nutrisail Products is backed by our 100% money back guarantee 60 day, no questions asked return policy. We have a FREE SAMPLE OF B-LITE Classic Daily Energizer waiting for you. This sample can be a 3 or 6 day sample depending on how many B-Lite you want to take per day. here is your chance to try it for free! 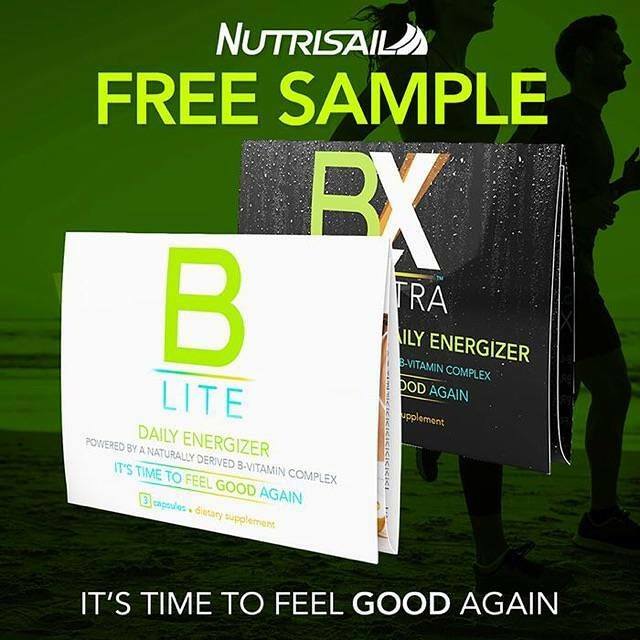 Free Sample of B-Lite Classic Daily Energizer is waiting for you. Click on the link below to get your FREE SAMPLE today! If the answer is yes, you need to try B-Lite Daily Energizer. Plant based protein is a better source of nutrition. Here is why, plant based proteins are lower in calories and higher in nutrient content and specially important is fiber, which improves digestion and reduces the risk of disease. But there is one nutrient missing from plant based diets which is vitamin B-12, this is found in animal products. So for people who are mostly vegan should consider supplementing with Nutrisail’s BFree which is high in bio available B Vitamins. Plant based protein is low in saturated fats. Plant based proteins are extremely low in saturated fats. Some, such as nuts, are a great source of healthy fats. Vegetarians are healthier. People who lead a plant based diet live longer and are also less prone to disease. But this doesn’t mean you need to give up meat completely; every person should find their happy place along the spectrum of lifestyle choices. If you can swap some of your meat meals with veg-protein based meals, you will be doing your body a favor. B-Lite is safe, non-toxic and healthy for your body and your brain. Also B-Lite Classic is powered by easily absorb-able B-Vitamin Complex. Plus B-Lite is a blend of powerful safe ingredients that help stimulate the fat burning process, and curb food cravings along with helping you have clearer thinking. So if you need safe daily energy give B-Lite Classic a try today. Visit the website below to read more about B-Lite Classic from Nutrisail. Be sure to Drink 1/2 your body weight in ounces of H2O everyday. Use distilled water with a small pinch of pink salt or water from your tap with reverse osmosis filter on it. Also drinking this much water everyday will..
Fluoride and chlorine can cause you pain and stop you from loosing weight? Yep its true…look it up. Along with drinking 1/2 your body weight in ounces of water, maybe you want a little help getting healthy. I suggest taking TWO capsules of B-Lite Classic when you wake in the morning with a large glass of that wonderful water. B-Lite Classic is full of B vitamins, energy producing herbs, appetite reducing herbs as well. Do the water and the B-Lite Classic for 30 straight days and I know for a fact that you will be healthier and happier with yourself. Here is how to get your 30 day supply of B-Lite Classic delivered to your door in less then a week. Go to the website below to read about B-Lite Classic and to place your order by phone or internet. With Nutrisail’s Life Style order you can save money. Who doesn’t want to save money? Nutrisail has put together specific Nutrisail products to make up the Life Style orders. Or need help with Reflux? Maybe you need to improve your immune system? Do you need better digestion? Our Nutrisail products help with so many health issues. Its really wonderful. Nutrisail products have no fillers in them. They are GMO and Gluten free. You will find that Nutrisail products work better then any vitamin that you have ever bought. Go ahead give our Nutrisail products a try. Place your Life Style order today and change your Life style to a healthy one. Go to www.Herbals-Unlimited.com to view all of our Nutrisail products. If you are confused and do not know which products would be good for your needs. Just give me a call. We can talk a bit and I will help you pick out the right Nutrisail products to fit your needs. Take 1 before every meal every day & you will feel better & look great in no time. B-Free is a caffeine free version of our popular B-LITE Classic. And it contains the same bio available, full spectrum Vitamin B complex. Also organic herbs and important minerals. Besides that B-Free delivers nourishment to support mental health. Also digestion and aids in the repair & prevention of adrenal fatigue. Therefore the remedy for adrenal fatigue is to recharge the adrenal glands. This can only happen with rest nourishment and a break from stimulants. B-Free is available in 45ct and 90ct bottles. If you need something WITH stimulants?